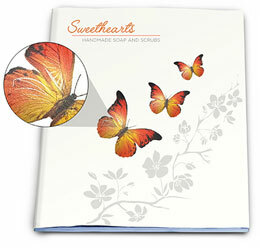 Spot color and UV printing gives catalogs perfect colors and dazzling special effects. Spot printing with Pantone inks helps you keep a consistent brand identity. Specifying Pantone ink for your company name, logo or accent colors means that the red print in your catalog will match the red on your labels, packaging and business cards. With Spot UV printing, a coat of varnish is applied to a catalog page and instantly cured with ultraviolet light. The fast drying varnish creates an irresistible shimmer. Use Spot UV on the front cover of a catalog to invite readers to look inside. Spot UV is suitable for any paper thickness, but we recommend using matte finish paper to accentuate the shiny finish of the spot UV finish. We can also apply a soft touch coating to enhance the paper's matte finish. This process is known as "silk spot UV." If you're mailing your catalogs, you'll save on postage by choosing a standard 5.5" x 8.5" size, which usually mails at the standard letter rate. 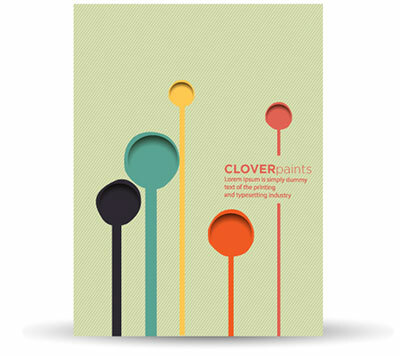 Our mailing templates help you design a back cover that will accommodate addresses and postage. Make sure your total catalog page count (including the front and back cover) is a multiple of four. Catalogs may seem old-fashioned as shoppers increasingly order through the internet. But catalogs work well in tandem with a strong web presence, and they can be a key ingredient in any multi-channel marketing campaign. Catalog mailings can lead to increased internet sales. They serve as a physical reminder and they entice people to visit your website. Use appealing, high quality images that show your products being used in inspiring ways. A photo of a hiker on a mountaintop can make people want hiking boots, while a beautiful Thanksgiving table can spur sales of stemware and tablecloths. Use data to identify different segments of your mailing list and send more than one version of the same catalog. You might have different versions of your catalog for smaller and larger homes, for people with children, or for different regions of the country. By using source codes and promotions, you can track each version's effectiveness. Use spot UV to "wow" people with a special effect. Spot UV gives catalogs a cutting edge look that encourages people to pick them up at trade shows and college fairs. It can add a fun touch to menus and event programs. And it's ideal for high tech products. Use spot Pantone colors whenever brand consistency is important. Pantone gives you the flexibility of four color printing while assuring that you have exactly the color you want in the place where it counts. Spot printing lets you put special effects where you want them. With a clever design, spot inks and UV treatment can produce a catalog that will have everyone saying "Wow." Have questions about using pantone inks or spot UV on catalogs?